Contrast sensitivity is your ability to distinguish the foreground from the background. A contrast sensitivity test measures your ability to distinguish between finer and finer increments of light versus dark (contrast). 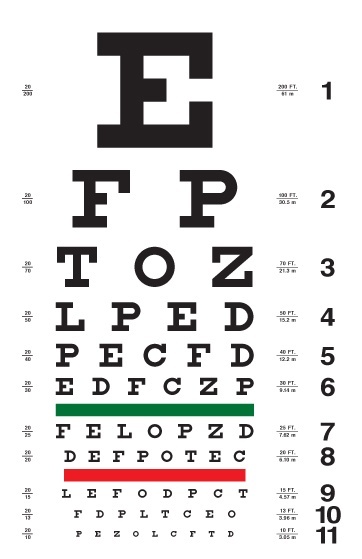 This differs from common visual acuity testing in a routine eye exam, which measures your ability to recognize smaller and smaller letters on a standard eye chart. Contrast sensitivity is a very important measure of visual function, especially in situations of low light, fog or glare, when the contrast between objects and their background often is reduced. Driving at night is an example of an activity that requires good contrast sensitivity for safety. It is important to note that contrast sensitivity is a much more sensitive measure of real world vision. 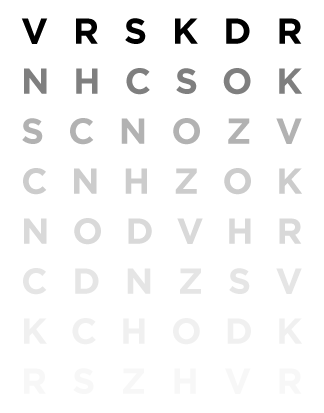 Even if you have 20/20 visual acuity, you can have eye or health conditions that may diminish your contrast sensitivity and make you feel that you are not seeing well. Contrast Sensitivity tests will provide your Eye Care Professional (ECP) a read on how you feel about your vision. It will also help to diagnose ocular pathology much sooner and allow your ECP to recommend a treatment plan based on your eye health needs as well as your lifestyle needs. For example in the case of early diagnosis of cataract formation, contrast sensitivity testing will allow your ECP to know when the ideal time is to recommend surgery. They can also diagnose other macular pathology early on, since contrast is the first part of your vision to go. In the case of athletes and occupations such as police, military, truck drivers etc., measuring contrast will help your ECP recommend supplements to rebuild macular pigment and optimize the use of light at the retina in a way that eyeglasses and contact lenses cannot provide. When a peripheral reference point is not taken, the system assumes everyone is the same which of course is not the case. MPOD varies with age (ocular lens pigment increases in the crystalline lens), dietary intake of carotenoids, smoking and other lifestyle factors. Measuring contrast sensitivity in a clinical setting however is simple, highly indicative of MPOD (low contrast correlates directly to low MPOD)1,2 and provides real world measures of how your patients are really seeing in everyday life. A study in 19873 demonstrates that contrast at 6cpd is the best predictor of face, sign and object identification. Since then studies in patients with early AMD1, diabetic retinopathy and central serous retinopathy4 and in patients with healthy eyes2 confirm the benefit of measuring contrast at 6cpd. These studies directly correlate low MPOD to low contrast sensitivity. Akuffo KO, Nolan JM, Howard AN, et al. Sustained supplementation and monitored response with differing carotenoid formulations in early age-related macular degeneration. Eye. 2015;29(7):902-912. Nolan JM, et al. Enrichment of Macular Pigment Enhances Contrast Sensitivity in Subjects Free of Retinal Disease: Central Retinal Enrichment Supplementation Trials – Report 1. Invest Ophthalmol Vis Sci. 2016;57(7):3429-3439. Interested in Contrast Sensitivity Testing? The M&S Technologies computerized vision testing system gives the user several methods of testing for contrast sensitivity functionality. Learn More.